Anthony McGowan was born in Manchester in 1965. Educated at a Catholic comprehensive, he won't say that his character's schooldays are exactly based on his own but he certainly writes from experience. Before turning to writing full-time, Anthony gained a PhD in Philosophy, worked as a nightclub bouncer, an Open University tutor, a journalist and a civil servant. He is married with two children. 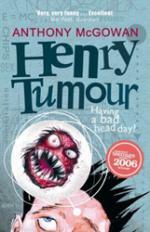 In 2006 he won the Booktrust Teenage Prize for his teenage novel Henry Tumour. The Bare Bum Gang is his first series for younger readers.